The field was soggy from rain the past several days, but spirits were high and dry as the Walk of Hope walkers congregated at Irwin Park in Homewood on Sunday morning. Cancer Support Center Executive Director Sue Armato said 630 walkers raised more than $78,000 to support the center's mission of providing support to area cancer victims. There’s a chance that 1,000 area residents will wind up on the front page of the Homewood-Flossmoor Chronicle. 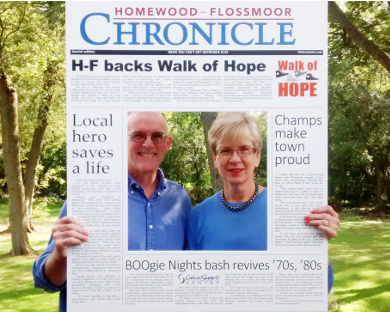 The Chronicle, a sponsor of the Cancer Support Center’s Walk of Hope on Sunday, has created a special “selfie frame” that looks like a page from Homewood-Flossmoor’s local newspaper. The Cancer Support Center is hosting its 25th annual golf and dinner fundraiser in memory of Steve Fallick at Flossmoor Country Club on Monday, Aug. 29. Golfers can register at 10:30 a.m. A complimentary lunch, sponsored by Land O’Frost, will be served before the shotgun start at noon. Golf continues until 5 p.m.
Cheryl Scott, ABC 7 meteorologist, will be the celebrity host for the Annual Cancer Support Center Gala on April 30 at Olympia Fields Country Club in Olympia Fields. The Cancer Support Center raised over $41,000 in online donations on Dec. 1 during the Giving Tuesday fundraiser. The Coleman Foundation matched $15,000. The funds raised will benefit those living with cancer and their families.